Late 1800s, pine, Inner Mongolia. 27” h. 41” w. 25¾” d.
This trunk is made with wooden nails and dovetailing. It has a lid decorated on the outside with floriated designs and the bottom supported by a double-base with each extending a little beyond the main body. The top tier of the base has paintings with auspicious motifs separated by short struts and the bottom one also has auspicious paintings. The decoration goes around to the sides. 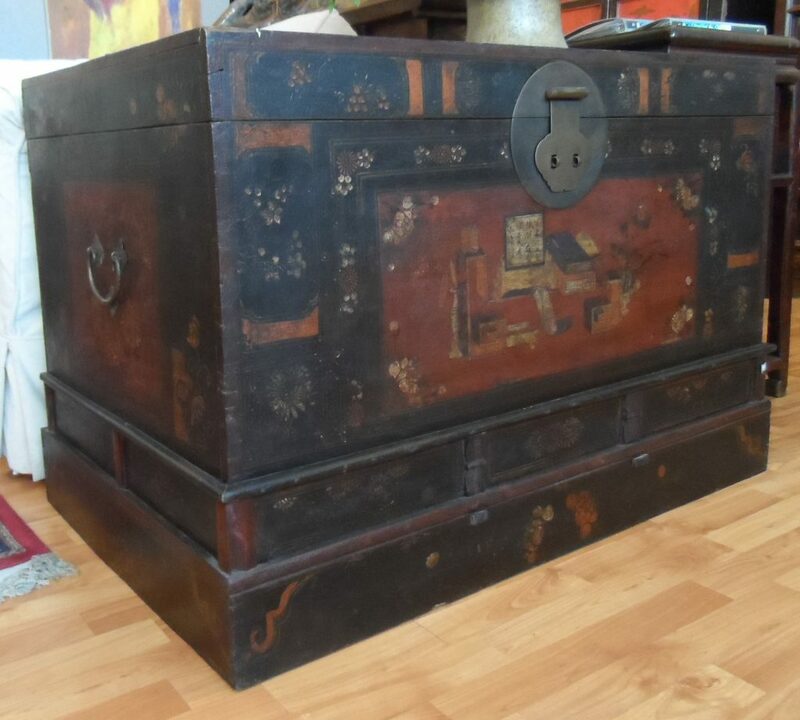 This trunk has a central painting depicting books, calligraphy and picture scrolls, a zither, chessboard, brush holder, writing brushes, inkstick, wish-granting wand, and a flower urn. All these items represent “The Accomplishments of the Scholar”. The border surrounding this central painting shows flower heads bordered by clusters of flowers. This is a trunk to hold a family’s clothing. To make it easy to move around, a metal handle is installed in the middle of the end panels. A big round brass latch secures the trunk. The wide flat top is useful for holding reading material, flower arrangement, or any favorite collectibles bed-side or sofa-side, or as a coffee table.